You’re probably here to download to the BEE, or to download the resource package required to play chambers created with the BEE. Don’t forget to add #BEEMOD to your published chamber’s descriptions to help people find cooler chambers like yours! Click HERE to search for those chambers now! If you have questions, post in one of these forums/discussion boards to get help from other users. I do check these boards myself to make sure questions are being answered, or that information is correct. If you want to have a pellet emitter disable after the pellet has been caught, then set the catcher to target a not gate, which then sends its outputs to the emitter, also make sure the emitter does not have “Start Enabled” checked. 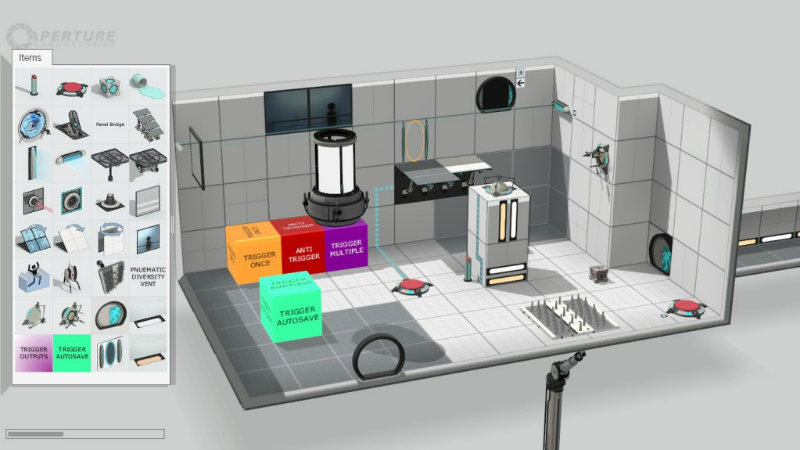 The BEE is an extension to the Portal Testing Initiative created by Valve Software. When you finish making your chamber with BEE installed you can publish your maps just like normal, however puzzles you make that include High Energy Pellets (HEPs) will require people who download your chamber to install the BEE-resource package before playing the chamber. If you are a savvy person you can use pakrat to package the HEP resources into your .bsp before publishing. By doing this people wont have to have the BEE-resource package installed to play your chamber. Fixed turret overlapping pellet catcher item on the palette. Fixed compatability issue with PTI Coop. Note: Autoportals will not work properly in coop mode, also this is a hotfix update and has not been tested at all. Fixed when starting a one portal chamber, when you walk through the entry door you loose the gun and get it back. That was designed for the preview mode, not to be in chambers when published. Fixed PDVs particle effects no showing up on loads from saved games. The link redirects me to the escapist, any reason for this? It did the same to me too. I used the other method. Both of the links just go to Escapist. Why? Is there a more recent download link? Ben, So I put the BEE2 (mac) folder into Steam/steamapps/common/portal 2 and I opened portal 2 but when I go to “create new test” and look at the create menu, it doesn’t change? I put it litteraly everywhere, I even took out every file one by one and it in random places but still nothing changes. Please tell me why this won’t work. Can you make a Timetrigger, like a normal button? I cant see monitors in that selection. I found folder with them but they are not in beemod… Any help? I really really need help. I am trying to publish a map using high energy pellets but it was just giving the “get bee mod message”. I used Packrat and added in all the right files but i still get the same error and i have spent the last 4 hours and can not find one single tutorial on how to stop the message from popping up. I really badly need this help i have looked everywhere online and i can’t find nothing! It is the only file that tells portal2 whether or not you have the right files. Sorry if you already answered this question, but how do I remove the BEE mod. Or how do I edit the menu for the chamber making process. I still want to use the orange gel, but one of the items from the mod replaced the gels. Except the cleansing gel, that’s still there. I have been trying to install beemod a lot of times but the start menu buttons won’t show up!!! 🙁 can someone help me? please help i downloaded new bee and i started getting building error how do i uninstall bee ? I installed it, opened portal 2, and none of the editor stuff is there. Ben, I REALLY need your help. I put the BEE2 folder and ZIP (tried without the zip nothing changed) and I opened Portal 2 but the menu didn’t change in the create thing. PLEASE help, I really want to advance my projects.